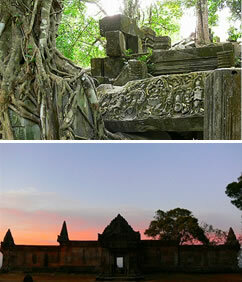 One of Angkor’s five major monuments, Preah Vihear is one temple not to be missed. This temple is located between the border of Thailand and Cambodia and has been recently pronounced as a new edition to the World Heritage site collection. 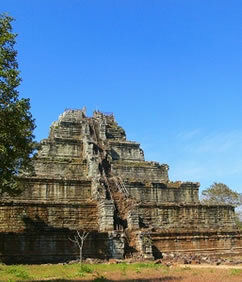 Have the opportunity to explore Koh Ker, Angkor’s pyramid like temple. *This tour will only have a guesthouse accommodation (to be settled by the guest). The bath system is basically water inside a pail and there is no proper hot shower for that matter. Booking in advance is strongly recommended, as it is not possible to do on the spot check-in. •	Meals as mentioned in the itinerary plus car and guide transfers to the sites. •	Accommodation fees, drinks during meals and site ticket fees are not covered by the package. To be settled separately. •	Please be reminded that Preah Vihear is still experiencing some Government related conflicts that might affect the outcome of the tour. Kindly participate in this tour at your own risk. •	Tour departure time is approximated. May vary depending on weather and travel season.